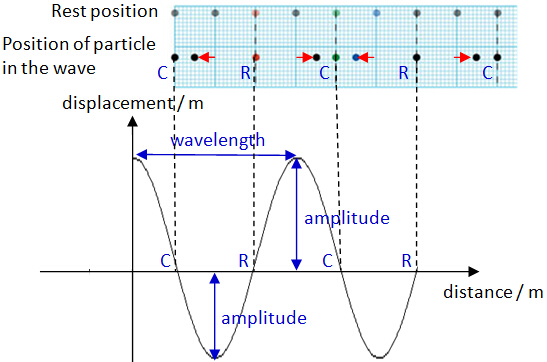 Wavelength, λ: the distance between two consecutive C or R or any two points that are in phase. Both C and R are at position of zero displacement﻿, which ﻿﻿a﻿re at rest position. Amplitude, A: maximum d﻿istance ﻿from the rest or central position, in either direction. Displacement-Time Graph is for an ﻿individual particle﻿ in the vibrating medium. It shows the displacement of a particle from the rest position at a particular time. At t = T s, particle is at displacement = 0 m.
Both C and R are at position of zero displacement. Period, T: time taken for each particle to complete one oscillation. Step 1: Locate positions of C and R. If we cant locate them, we cant predict. Step 2: Draw a new wave in the wave direction and locate new position of C and R.
Step 3: Trace out ﻿a vertical line from new C and R﻿. This line will help us to determine the movement. For particles lie on the wave from A to D, they will move to right.